An enemy sniper fired on the Maryinka entry/exit checkpoint on Friday afternoon, and the Ukrainian border guard was wounded. 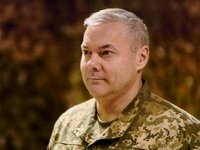 Currently the checkpoint temporarily isn't working, commander of the Joint Forces Operation (JFO) Serhiy Nayev introduced the "red" regime. "At 14:00, an enemy sniper fired at a checkpoint of the first defensive line in front of the Maryinka entry/exit checkpoint. As a result of the attack, senior lieutenant of the State Border Service of Ukraine Oleksiy Koneveha was wounded in the leg. He was taken at the military hospital," the JFO staff said on Facebook.